When you imagine the American police officer of the future, what do you see? 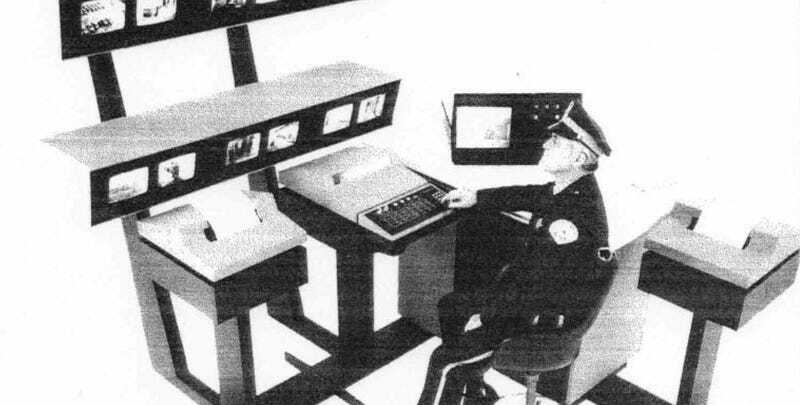 In the 1980s, one police officer saw “supercops”—a highly trained force of professionals who had the most high-tech toys at their disposal and almost never killed people. James R. Metts wrote an article for the October 1985 issue of The Futurist magazine about these “supercops” of the future. The piece is part utopian fantasy (jetpacks!) and part dystopian nightmare (surveillance! ), but it’s also a fascinating look into what some people thought cops would look like in the future—just two years before the original RoboCop would hit theaters. As an interesting sidenote, Metts spent 10 months in federal prison just a few years ago. He was the sheriff of Lexington County, South Carolina for over three decades, and despite being an anti-immigrant figure in the community, Metts took bribes from local businesses to keep undocumented workers out of his jail. American cops of the early 21st century are arguably the most brutal police in the developed world. Unarmed black men are routinely killed by American police officers—sometimes in their own backyards. But back in 1985, Metts had different ideas about policing in the future. Tomorrow’s professional cop will have to be educated and educatable. As a minimum requirement, a bachelor’s or master’s degree in the social sciences will be needed. A law degree may also be deemed necessary for police officers by the early twenty-first century. Recruitment will take place at the best college campuses. Tomorrow’s supercop will have to be bright, resourceful, and versatile. In the past, a policeman was given a badge and a gun and told to hit the streets. Tomorrow’s supercops will have an array of sophisticated devices with which to do their jobs. Police are already using new nonlethal weapons such as the “taser gun,” a weapon that stuns its victim with an electrical shock without causing permanent injury. New weapons and devices will include laser guns, light guns, and electronic restraints, as well as newly developed surveillance equipment. And while nonlethal weapons are certainly being used with more frequency, that part about not causing permanent injury is up for debate. Tasers are cited in a shocking number of police-related deaths in the United States. Robots are already being used by police in a few cities for such activities as traffic control. In the future, we will see robots being used in such crime-fighting situations as storming barricaded criminal hide-outs or dispersing tear gas at riots, reducing the risk to human officers. Sure, we don’t have RoboCop yet, but smoking out barricaded suspects certainly isn’t unusual these days. Israeli soldiers have also been using flying robots (more commonly called drones) to attack Palestinian demonstrators with tear gas. Sometimes the robots of the early 21st century are sent with the explicit mission of killing, as in America’s continuing drone war over the Middle East. In July of 2016, even police sent a robot equipped with a bomb to kill a sniper in Dallas, Texas. In the transportation department, “space buckets” and “jet packs” will allow the officer to soar above and around congestion or to hover a few feet above the scene of a fire, accident, or disaster. What’s a “space bucket”? Your guess is as good as mine. But it sure sounds neat. Maybe it has something to do with those strange looking police cars that Arthur Radebaugh was dreaming up in 1958. Tomorrow’s police officers will have a computer in their automobile for immediate retrieval of criminal-history information. Computer networks will provide birth-to-death dossiers, giving officers immediate field information. The supercop will need to be flexible enough to deal with many divergent ethnic and social groups. There will be few easy answers in tomorrow’s diverse and protean society. Police officers may be called upon to deal with crimes as diverse as illegal-gene threats, computer theft, and nuclear terrorism. The photo is never really explained in the article, but I’m guessing that this image is what that “divergent ethnic and social groups” line is supposed to be about. It seems fitting then that Metts, the anti-immigrant sheriff would go to prison for taking bribes to keep undocumented workers out of jail, would use such a bizarre, racist photo. Police work, as we now know it, will cease to exist. Public-service officers will be society’s “caretakers.” They will still be the first line of public defense, but their role in society will be largely a matter of human-resource delivery. If they still carry guns, those guns will be loaded with “shock” bullets. Police use of deadly force will be nonexistent. People will call the police for help, as always, but they will demand and receive the services of professional “caretakers,” whose primary tools will be their legal, social, and technical expertise. The inaccuracy of his predictions would be downright funny if it weren’t so deadly.